Víkingur is using Smore newsletters to spread the word online. whats in it and how does it work? Þegar fólk talar um kappakstursbíla eða afkastamikla sportbíla kemur umræðuefnið um túrbínur oftast upp. Túrbínur koma einnig á dísel vélum. Túrbína getur aukið hestöfl vélarinnar til mun án nokkurar meiriháttar þyngdaraukningar. Það er stóri kosturinn sem gerir túrbínur svo vinsælar. Í þessari grein munum við læra um það hvernig túrbínum bæta afl vélarinnar á meðan þær lifa af við ótrúlega erfiðar aðstæður. Við lærum einnig um það hvernig affalsrör, keramiks túrbínuspaðar og boltalegur hjálpa túrbínum að gera vinnu sína enn betur. Túrbínur eru tegund af kerfi sem myndar örvun. Þær þjappa loftinu sem flæðir í vélina. Kosturinn við að þjappa loftinu er sá að það leyfir vélinna að þrýsta meira lofti ofan í strokkinn, og meira loft þíðir að meira eldsneyti getur bæt við. Þar af leiðandi færðu meiri kraft frá hverri sprengingu í hverjum strokk. Túrbóvædd vél skilar almennt meiri kraft heldur en sama vél án túrbínunnar. Þetta getur breytt hlutfalli milli krafts og þyngdar til muna fyrir vélina. Til þess að ná þessari aukningu notar túrbín útblásturinn frá vélinni til þess að snúa sér og í leiðinni loftpumpu. Túrbínan snýst í allt að 150.000 snúninga á hverri mínútu, sem er um það bil 30 sinnum hraðar heldur en flestar bílvélar geta gert, og þar sem hún er tengd útblásturshluta vélarinn er hitinn í túrbínunni rosalega mikill. 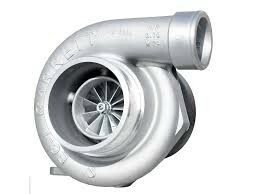 When people talk about race cars or high-performance sports cars, the topic of turbochargers usually comes up. Turbochargers also appear on large diesel engines. A turbo can significantly boost an engine's horsepower without significantly increasing its weight, which is the huge benefit that makes turbos so popular! In this article, we'll learn how a turbocharger increases the power output of an engine while surviving extreme operating conditions. We'll also learn how wastegates, ceramic turbine blades and ball bearings help turbochargers do their job even better. 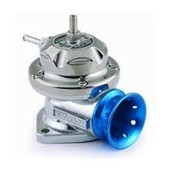 Turbochargers are a type of forced induction system. Theycompress the air flowing into the engine (see How Car Engines Workfor a description of airflow in a normal engine). 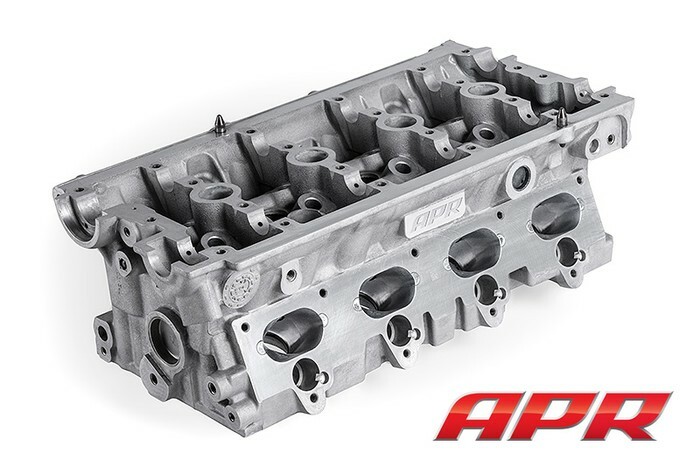 The advantage of compressing the air is that it lets the engine squeeze more air into a cylinder, and more air means that more fuel can be added. Therefore, you get more power from each explosion in each cylinder. A turbocharged engine produces more power overall than the same engine without the charging. This can significantly improve the power-to-weight ratio for the engine (see How Horsepower Works for details). In order to achieve this boost, the turbocharger uses the exhaust flow from the engine to spin a turbine, which in turn spins an air pump. The turbine in the turbocharger spins at speeds of up to 150,000 rotations per minute (rpm) -- that's about 30 times faster than most car engines can go. And since it is hooked up to the exhaust, the temperatures in the turbine are also very high. I choose to translate this turbo system article because i wanted to know more about turbo's and i think that they are fascinating. i just searched for how does turbo work and found this article on how-stuff-work.com so i decided to take it. I learned a lot by translating this text and learned a few new words like wastegate, ceramic and cylinder. 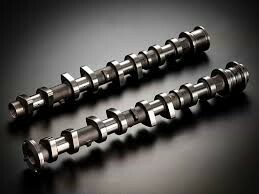 Camshaft is the engine‘s brain, it controls the Hp/Nm curve and also the rotation of the intake and exhaust valves that let the air in and out of the cylinders and through the head and out to the exhaust pipes. It also controls the idle. The camshaft rotates on half the engine‘s speed, the camshaft gear is therefore twice as big (twice as many teeth) as the crankshaft gear. The time (measured in degrees) that it takes to lift the valves is called the cam‘s process. To compare two shafts they have to be the same at 0.050 opening. To see the difference you use the process at .006 because that much quicker process and better power band. If process and better power band. If you know the advertised duration at .006 you can find out fast the process is. You take the process at .006 and deduct it from the process at 0.050 and if the number is bigger than 53 the shaft is tender. From 53 to 49 it is warm and if it’s under 49 the camshaft is called hot, then the idle is uneven and a lot overlap. The intake valve opens before the piston is in highest position and closes after it’s in the bottom. The exhaust valve opens before the piston is at the bottom and closes after it’s in the top. Duration is measured in degrees and tells you how long the valve is open, 360 degrees means that the valve is always open. If higher duration, the longer it takes the engine to get new air, the valve is open longer. Intaksventillinn opnast á undann toppstöðu stimpils en lokast á eftir botnstöðu stimpilsins. I choose this text because I thought it had some good information on what the camshaft is, as it has but the text in Icelandic might have been better written. This text thought me a lot, like how you compare two camshafts and why the idle is worse if you have a hot camshaft. inside the head is the crankshaft, which turns the engine. 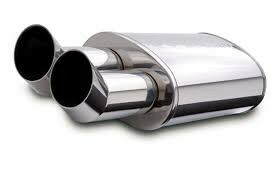 it is at the end of the exhaust system to lower the noise from the engine, but sometimes there are big mufflers to increase the sound. it helps the turbine get rid of steam. What is it like to be a mechanic? 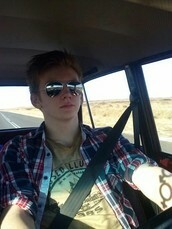 I choose Sveinn Orri because he is my friend and he works in a workshop. He is learning to become a mechanic at Fjölbrautarskóli Suðurlands and is graduating next semester. He is looking forward to open his own workshop in the future. He really knows a lot about cars and has been working around them for 5-6 years, that's the main reason why i interviewed him. I sent him the Questions on facebook and the conversation was like this. Hi Sveinn, i'm doing an interview for my English class about cars and I was hoping that you could be my interviewee? V: so how is it to work around cars and in the workshop? S: It's great, I really like it. V: is the morale good at the workshop? S: yes, the boys are all very fine and as expected all different characters, so yeah, we are always laughing and joking around. V: You work at Toyota Selfossi, which is a pretty big workshop, do you have to have education to work there? S: yes, or you have to at least be learning it like I am. there are some older guys that have finished their education and there is me and 2 other guys that are still learning, and obviously we do not rule anything there. V: okay, thank you Sveinn for the interview. He talks about that great cars are like art. He talks a lot about BMW and I like BMW very much. He talks about that people work together on making great cars. and how people think about beautiful cars in a different way than they did before. American designer Chris Bangle explains his philosophy that car design is an art form in its own right, with an entertaining -- and ultimately moving -- account of the BMW Group's Deep Blue project, intended to create the SUV of the future. The car fleet on the earth is always growing and compared to next years marketing numbers the car population could go up to 1.1 billion. Still only about 12% of the worlds population owns a car. The future in cars must be electronic and hydrogen. General Motors veep Larry Burns previews cool next-gen car design: sleek, customizable (and computer-enhanced) vehicles that run clean on hydrogen -- and pump energy back into the electrical grid when they're idle. this man talks about putting a supercharger on a motorcycle. they are two and talk about what they have done in their lives. They have made solar and wind products and they decided to make a motorcycle together. It is electric and better than all other electric motorcycles.